A high-speed rail project between the two countries has been canceled. Prayut made the surprise announcement after meeting his Chinese counterpart Li Keqiang on the sidelines of a regional meeting on Mekong River-related issues in the southern Chinese city of Sanya. The two sides broke ceremonial ground on the $15.7 billion line in December despite the lack of a final deal. Prayut said upon announcing the cancellation that his government would solely finance a shorter bullet train passenger line linking Bangkok to the central Thai town of Nakorn Ratchasima. The revised line will be one-third of the megaproject’s originally designed distance, or some 400 kilometers short of the northeastern Thai-Lao border, and lack a clear economic rationale. While local press reports portrayed Prayut’s executive decision as protective of “national interests,” it is not clear that the project’s cancellation will be to China’s detriment. That’s because the truncated line will still rely on Chinese engineers, equipment and construction firms, effectively giving Chinese companies no-bid building contracts without any underlying investment risk. Thailand had balked at China’s proposed 2 percent interest rate on project-related soft loans on the apparent financial logic that it can raise capital more cheaply on local bond markets, where ten-year notes now trade at 1.8 percent, and from state-linked investment funds like the Varuypak Fund and newly announced Future Fund. Before the cancellation, Prayut had faced politicized criticism for not driving a harder bargain vis-à-vis Beijing, a not-so-subtle insinuation that the country has grown overly dependent on Chinese succor under his military rule. The Thai junta has looked to Beijing for diplomatic and strategic support at a time when the United States and EU have relentlessly criticized the military’s suspension of democracy, curbs on civil liberties, and rights abuses. Some analysts viewed the joint railway, a high-tech engine for the junta’s 20-year strategic economic plan, as symbolic of Thailand’s broad shift away from the West and toward China since the May 2014 coup. China’s apparent unwillingness to budge on costs, interest rates, and land rights is indicative of a counter-shift, one where Beijing will apparently require profits over mere political and geostrategic benefits from its overseas infrastructure investments. In 2010, when the high-speed rail was conceptually agreed under a Democrat Party-led government, Beijing indicated it would shoulder most of the investment, both to accelerate regional trade under the ASEAN-China free trade agreement and to showcase its bullet train building capabilities to the region. That government-to-government plan was derailed when Yingluck Shinawatra’s Peua Thai party outpaced the Democrats at the 2011 general elections. Korn Chatikavanij, a former finance minister who initiated the bullet train concept under the Democrat government, believes the junta has misplayed its hand. He argues the regime signaled too early, too strongly its intent to build the line even without a Chinese commitment to co-invest. In comparison, Korn says he made clear from the outset that Beijing should cover most of the costs, as it stood more to gain economically and strategically from the link. He suggests that Prayut should seek talks at a leader-to-leader level, rather than negotiate directly with the state-run, profit-seeking China Railway Construction Corporation. Korn claims that was key to finalizing the recent China-Indonesia high-speed rail deal. It’s not clear that Prayut’s shortened line, viewed already by some independent financial analysts as a “face-saving exercise” aimed at sustaining Chinese interest in co-investing in the remaining 400-kilometer segment to the Thai-Lao border, will necessarily be either. The government has provisionally estimated the Bangkok-Nakorn Ratchasima high-speed passenger line will cost between 170-180 billion baht ($4.8-$5.1 billion), a likely gross underestimate of the project’s actual costs, according to the same financial analysts. They suggest funds would be better spent on upgrading existing tracks from single to double gauge for more efficient, trade-promoting freight transport. 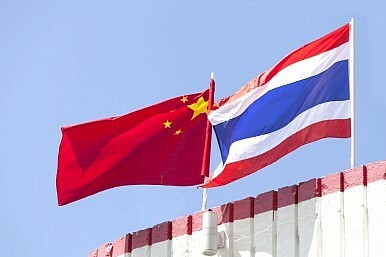 Thailand 2019 Elections: Conflicting Claims as Final Result Wait ContinuesThe Real Lesson in Thailand’s Struggle With a China Rail ProjectChina-Thailand Rail Project Back on Track With Cost AgreementThailand’s Post-Coup Foreign Policy: Omnidirectional or Directionless?Can Thailand's Junta Reverse its Economic Decline?